Toledo Integrated Systems is not only well-versed in mechanical and hydraulic presses, we're also able to completely design, engineer and commission your forging application. There are many aspects of the forging process. At Toledo Integrated Systems, we're well aware that every application is different and most applications don't fit in a black box. 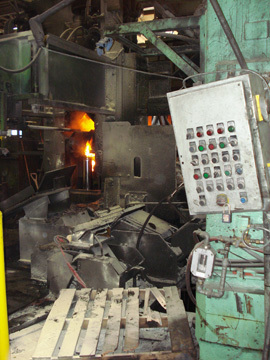 While our standard forging control and automation package includes the basics for any automation system, we're able to provide you with the customization that you're looking for. This could include custom stage settings, furnace control and monitoring, induction heater monitoring and press room networking. 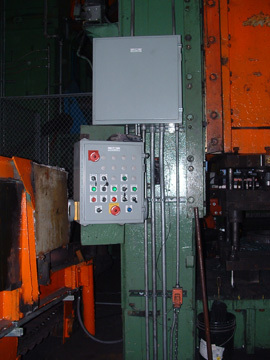 Below is a general list of what's included with our forging press control solution. If you would like to know more about our press control solutions or have any questions, contact us using the form below or at 1-800-TTOLEDO. 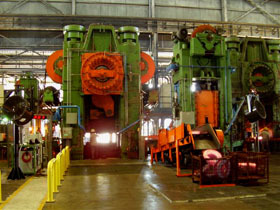 Scope: Two large forging presses were controlled through one outdated PLC. The end-user wanted these controls separated and brought up to date with regards to hardware and safety. Our team needed to integrate new controls into the existing line and interface with a sheer and ABB robots. Method: Our team was on-site to monitor the tear-out and installation process. We were able to successfully separate the two forging presses and start with our I/O checks. One press was relatively simply to integrate. It was a single station with no interfacing required, just basic forging controls and safety. The other press however required interfacing with the shear, ABB robots and trim press. Our control engineers were able to integrate with the PLC 5 (sheer PLC) through the HMI and the ControlLogix (Robots) through remote I/O. This specific process required a blend of robotic/human operator involvement. Once the billet was out of the sheer, the first ABB robot would grab the billet and place it in the first station of the press die. The operator would then adjust the billet as needed and run three or four blows on the billet. Once finished, the operator would send the second robot in, through the HMI, to extract the billet and place it in the trim press. After the billet was trimmed, the process would restart. Results: We were able to successfully separate the two forging presses and bring both press controls up-to-date with regards to automation, hardware and safety.